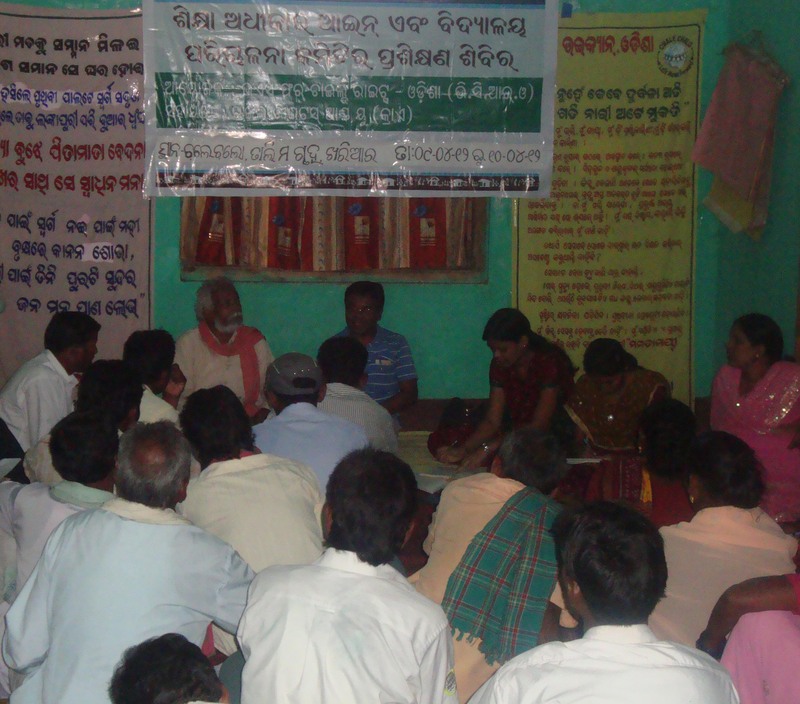 A district level consultation on RTE and formation of Nuapada District RTE Forum was held on dated 30th June 2014 at the Conference Hall of CHALE CHALO, Khariar with the active involvement of representatives of CSOs, SMCs, PRIs, NGOs and Government Officials. The program has been organized jointly by Sikshasandhan – Bhubaneswar and Chale Chalo – Khariar. Mr. Rudra Madhab Barik, Chairman of Chale Chalo facilitated entire deliberations. The resource persons Mr. Dinabandhu Bishi, Ex HM and BRP, Mr. Suresh Kumar Routray, ABEO, Khariar, Mr. Tularam Barge, Mr. Ravishankar Sabut, Mr. Hirasingh Majhi and Mr. Anudram Putel CRCC, Boden took the lead role in discussions and through lights on different aspects of RTE Act & status of implementation in Nuapada. The participants revealed that they have not found a single school in their GPs, which fulfills all the RTE norms and the implementation of RTE on the ground is very dismal. The participants felt the need of a District Level RTE Forum and after detailed discussions and sharing of experiences of RTE status in the district, the participants formed the Nuapada District RTE Forum with a 15 members Executive Committee to work for proper implementation of RTE norms in School in the district for ensuring quality education in government elementary schools. The day long consultation and formation of Nuapada District RTE Forum were concluded after formulation of an Annual Action Plan. 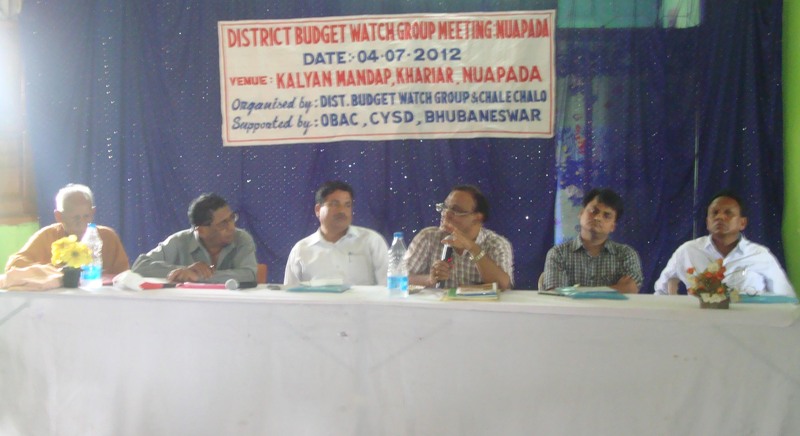 District Level Consultation on NFS Act 2013 was held at Chale Chalo, Khariar in collaboration with VCRO, Bhubaneswar. 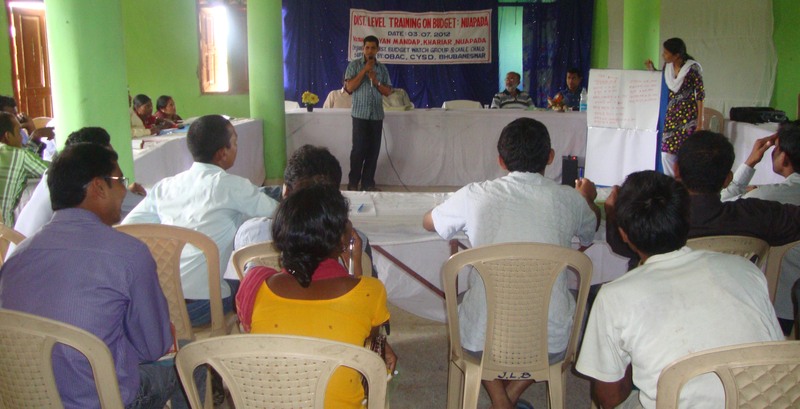 41 participants representing NGOs, ICDS workers, PRI and SMC members, media fellow, activists and academicians had participated in the program. Ex-Asst. Agriculture Officer Mr. Pustam Sunani, CRCC Mr. Tularam Barge, ICDS Lady Supervisors Smt. Tulshilata Rout & Ms. Niharika Padhi were the local resource persons. Zilla Parishad Member Mr. Lambodar Nial inaugurated the program as Chief Guest. CRY Fellow and State Advisor to Supreme Court on Food Rights, Mr. Rajkishor Mishra, facilitated the entire consultation process as chief resource person. The resource persons presented the major components in National Food Security Act 2013 and the participants shared the food security situation in the region. They made action plan to help all the genuine poor to get included in NFSA 2013. The district level RTE Mela was held at Koushalya Mandap, Khariar in collaboration with Odisha RTE Forum / Sikhasandhan, Bhubaneswar, Lokadrusti Khariar and OXFAM-india. Mr. Abani Mohan Panigarhi Member Secretary of Lokadrusti presided and Mr. Rudra Madhab Barik, Chairman; Chale Chalo facilitated the program. Dr. Fanindam Singh Deo, Former Principal of Khariar Autonomous College, Khariar & member of CWC, Nuapada, had joined as Chief Guest, Major Dr. Ram Chandra Mishra, former principal of National College Nuapada & Chairman of Lokadrusti, Sri. Suresh Kumar Rautray, ABEO, Khariar and two PRIs representatives Smt. Dehuti Dhrua, Sarpanch Farsara, Smt. Jyoshna Manjari Barik, PS Member, Khudpej GP joined as Guest of Honor in RTE MELA. 164 participants mainly representing education sector and working on education issues participated in the program. The guests and participants had serious refection on achievements of RTE Act after 3 years. They had sited case studies where some improvements have been made in school infrastructure and education and presented the gaps. The participants had brought the list of school wise non – compliances of RTE norms and decided to bring them to the notice of the state and central government authorities for speeding up the process of complete RTE compliances in schools and pave the way for improving the learning competencies through quality education in government schools. The participants had displayed interesting posters, folders, drawings, write ups, songs and street plays describing the reality of RTE status in schools. 2 Signature campaigns on RTE in 15 villages and NFSA in 27 ICDS centre have been done with the support of Odisha RTE Forum / Sikshasandhan and VCRO respectively. The copy of charters of demand had been submitted to the state government. As follow up of NFSA campaign Chale Chalo has been tracking the growth and malnourishment of Pregnant Women, Lactating Women and children. A district level consultation on Child Protection in the framework of ICPS and Juvenile Justice System was held on dated 13th February 2015 in Chale Chalo Conference Hall, Khariar. Mr. Rudra Madhab Barik, Chairman, Chale Chalo and Mr. Harihar Naik, Convener CCRP / VSUNDHARA facilitated the consultation. Dr. Fanimdam Singh Deo, Member of CWC, Nuapada, Smt. J Pradhan, IIC Boden, Ms. Teresha Xess Sub Inspector of Police, Khariar and Mr. Achyut Das and Director, Agragamee joined as resource persons. Members of GP Level Child Protection Committees, PRIs and CSOs Representatives, Teachers, SMCs’ members, ASHAs, AWWs and Child Rights Activists took active part during the consultation process. The consultation mainly focused on Role and Responsibility of CWC and JJB, Issues addressed by CWC and Women and Child Desk in the district, Major issues of Nuapada district on child protection and different government schemes / programs for children. CWC – Nuapada has prepared a database to track the children of the district and especially the focus is on child need care and protection. Role and responsibility of the Inspector in Charge of Women and Child Desk in the police station have also highlighted. Leaflets on various child rights legal provisions and act were distributed. Mr. Naik explained in details about the child protection mechanisms working in the state and district. There was a lively question and answer session regarding ICPS and JJB. The participants made an action plan for activation of GP Level Child Protection Committees. The consultation was ended with a vote of thanks to all the participants by Rajkumar Meher, Coordinator, CRY – Child Community Radio Project of Chale Chalo. IVDT-UK has been supporting a small amount towards Chale Chalo Core Cost since 2014 separating from other supported projects to meet part of House Rent and incurring expenses of Chale Chalo Head Office situated at Bhubaneswar, part remuneration to the Director and travel for functionaries / staffs for enabling the organization to further build up its capacities and competencies in raising funds, networking and better facilitating and managing its organizational and development projects and activities in Odisha and elsewhere. The support has been used judiciously for meeting major part of the house rent and incurring expenses of Chale Chalo Head Office in Bhubaneswar and a small part of director’s remuneration and travel for functionaries/staffs enabling them to carry out organizational core activities, better facilitating and managing the organization and its development projects, strengthening networking, meeting the legal and donor compliances, carrying out reporting and documentation works required at organizational levels and building capacities and undertaking further funds raising initiatives. This has helped in smooth running of the organization’s head office in Bhubaneswar for better functioning, coordination, liaison, alliance building, networking, fund raising and management of development projects.